The Midnight Circus started as a collaboration between circus clown Jeffrey Jenkins and actress Julie Greenberg. They combined their talents to create a 5 minute eccentric acrobatic act to be featured with Vermont’s Circus Smirkus. While on tour with the show, they apprenticed themselves to two former stars of The Moscow Circus. In between shows and practice, they would all sit over a cup of tea (or a more than occasional vodka!) and share aspirations and ideas for the future of performance. It was in that backlot that the seeds were planted for The Midnight Circus. 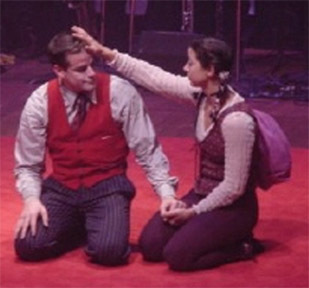 In 1997, having returned to Chicago, they created a show called The Midnight Circus: When Circus and Theatre Collide, which was what happened when a Shakespearean troupe and a Circus troupe end up sharing the same performance stage, and what happens when they mix. That show got great reviews and ending up running in various incarnations for the next year. Later that show was licensed by the Big Apple Circus, which took it on tour to large theatres across the United States. Since that time Jeff and Julie have served as artistic directors for Circus Smirkus, have created many other shows in the Chicago area, including a tented show called The Big Bang and Other Amazing Adventures! which played in a tent on Chicago’s Museum campus for three months, and an annual Haunted Hijinx show in Daley Plaza, which combines the theme of haunted house and circus arts. They also work with many of the other Chicago Theatres, performing and directing. In addition to this work they tour the cruise ship circuit, create shows for corporations, and have collaborated on another front: they have a child together. The Midnight Circus also has had at one time or another training opportunities and performance opportunities for most of Chicago’s clowns at one time or another.